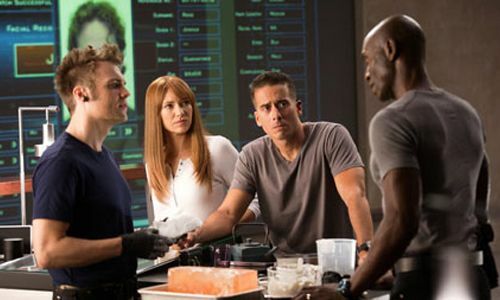 Cultural Wormhole: Fringe - "Amber 31422"
Lincoln Lee (Seth Gabel), Olivia Dunham (Anna Torv), and Charlie Francis (Kirk Acevedo) go over a case with their superior Phillip Broyles (Lance Reddick). One of the aspects of the third season of 'Fringe' that I've really enjoyed is the development of the Alt-Fringe world. Sure, the various historical differences are fun, but it's ways that day to day living is effected by the unique conditions and technology "over there" that I find the most compelling. Between things like the "Show Me" identification cards and abundance of public surveillance devices, there's clearly a more omni-present feel to that world's American police and military forces. Then there's the amber. Due to our Walter Bishop's breaking of through the dimensional walls to steal Peter, the fabric of space occasionally suffers tears and holes that need to be sealed off. The amber was created by Walternate as a means to do just that. Unfortunately, innocent civilians have been caught within it on occasions, forever frozen in the hard transparent yellow material. However, Walter's movement between worlds may not be the only cause of these spacial breakdowns, as we learned from "Amber 31422". The amber has been used to seal tears brought on by Joshua Rose's machine that allowed him to pass through solid walls. Still, Walter's altercation was the first event, but situations like Rose's high tech hiests didn't seem to be helping matters as far as the fabric of space "over there". Rose's device and methodology is also a callback to the first season episode "Safe". Similar style bank robberies took place on our side of the divide, though. It wasn't until I began thinking about past Fringe cases that I remembered that we first saw the amber way back in season one's "The Ghost Network" when the ZFT used in on a bus. The ZFT and Mr. Jones' had been experimenting with different Alt-Fringe technologies and these revisits help tighten up the 'Fringe' mythology. As far as the this week's case is concerned, it was fairly predictable. The twin swap and Joshua's need to punish himself were telegraphed, but how the case informed Olivia's own dilemma was where the real story laid. I have to admit, I'm growing fond of Lincoln and I've always loved Charlie Francis, no matter which universe he hails from. Ghost Peter has been a nice way of including Joshua Jackson in the Alt-Fringe stories since he is the only version of the character left in either universe. Everything came together when "he" helped Olivia realize that everything he has been saying was actually from her own mind. "Peter" was just her minds way of trying to restore those recorded over memories. Olivia's jumps back to our universe were incredibly exciting. First, this sets up the seeds for her eventual return to her own world, but leaves open the idea of her being able to come back. Once "Peter" helped her realize what she left behind, followed by her heartbreaking birthday phone call to Ella, we got our Olivia Dunham back. It's going to be fun watching her navigate the Alt-Fringe world with both sets of memories and a new agenda. As I said in other reviews, this season of 'Fringe' has not been entirely new viewer friendly, but for those that have been following it since the beginning, it's been a hell of a ride. We're getting the best of both worlds with these episodes: regular Monster of the Week episodes but in the context of a continually unfolding arc. I hope that 'Fringe' can keep this kind of focus for the rest of the season.